Classed as one of the top 5 rides in New Zealand the West Coast Wilderness Trail will deliver on all aspects of a rewarding ride through magnificent New Zealand native forest – along coastlines that only the west coast can deliver and sights of the majestic Southern Alps all from your bike seat. 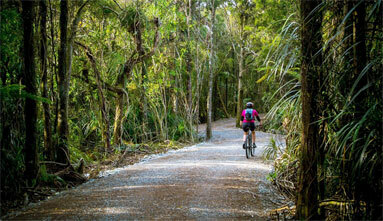 Experience the various sounds of birdlife, waterfalls and yes even the patter of rain if riding the wet season. The winter months of May June and July can sometimes present the best of the best in weather conditions, with snow on the mountains and sun or your back this can be the quiet time to have this track to your self (sssssssssshhh the word is getting out there). Check out the links below so you can start a plan. We can cater for every aspect of this ride. The hire of bikes, the accommodation, the shuttle to and from the Tranz Alpine and Hokitika Airport or just from your accommodation to the starting points and if you enjoy it that much check out the link to various mountain biking tracks – its all here you know. The West Coast Wilderness Trail is not to be missed.